A safe (or coffer, strongbox) is a lockable enclosure used for storing valuables against theft or damage. Safes provide burglary or environmental protection but rarely excel in both. Likewise, the security rating of a safe is divided between burglary and environmental protection categories. Vaults and strongrooms are essentially large safes, though their construction and security needs are different. Safes have existed in various forms for thousands of years. As with locks, it wasn't until the late 1700s that security became the primary concern. Prior to this, the design and manufacturing of a safe was, for the most part, an artistic endeavor. The history of safes and their advancement closely parallels advances in metallurgy and the design of locks. Ancient and medieval safes were built of wooden chests, with later versions bound by iron bands. These early safes were mostly artistic, often having detailed carvings and precious materials inlaid on their surfaces. Many safes of this era were markedly complex, with some having several dozen locking bolts. Despite their complexity, most could be easily picked or forced open. 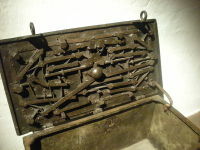 17th century German safe; complex bolt mechanism. As safes became heavier and more complex, the upward opening chest model became too difficult to open and close. Safes transitioned to outward swinging doors mounted to the side of the container. Safes began to use to full metal bodies, first with iron and then steel. Safes became wood completely encased in metal sheets that were riveted together, then full metal safes that were poured or molded to shape. The refinement of metallurgy techniques led to the combination of additional metals with steel. These combinations strengthened the steel in many ways. Copper, for example, can be used to provide heat transfer or corrosion resistance. In the early 1800s, fire-resistant safes were introduced. Prior to this safes did not protect against fire, and often helped destroy valuables stored within by being made of heat conductive materials. Though a patent was filed by Richard Scott in 1801 for fire-proofing a safe, it does not appear that it was put to use. Locking mechanism and main board of an electronic safe. Many modern safes use electronics rather than a lock or dial, to lower manufacturing costs and prevent manipulation, however they often include a standard lock as a reset function. They function in the same way as standard safes, but use an electronic solenoid to prevent the bolt from retracting. Burglary safes are designed to protect against various forms of safecracking, particularly destructive entry in the form of explosives and drilling, and non-destructive manipulation techniques such as lockpicking, impressioning, and decoding. The level of security offered by a burglary safe depends on the types of attacks it is designed to withstand and the duration it is expected to provide security. Burglary safes typically resist attack for as little as 5 minutes and up to 20 hours or more. Burglary safes are commonly bolted down, built into a wall or floor, or surrounded by concrete to prevent physical removal of the safe, a historically popular technique. A fire-resistant safe is is designed to protect contents from high temperatures or actual fire. Fire resistant safes are usually rated by the amount of time they can withstand extreme temperatures while not exceeding a set internal temperature. Models are typically available that resist heat between half-hour and four-hour durations. In the USA, Both the standards writing and testing of fire-resistant safes is performed by Underwriters Laboratories. The primary difference between a safe, a vault, and a strongroom is that safes are movable. Vaults and strongroom are integral to the building they are located in. A vault is a secure room or series of rooms. 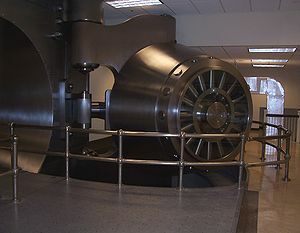 Many buildings contain vaults, though they are usually associated with banks. Large businesses, military buildings, casinos, and schools often have vaults to protect valuables, intellectual property, and dangerous objects. The name vault comes from the fact that these rooms were often in the basement of the building where the ceilings were vaulted. Strongrooms are basically smaller, less secure vaults. They were popular in the late 19th and early 20th centuries, before construction methods made large vaults possible. This article is a stub. You can help Lockwiki by expanding it. This page was last modified on 21 April 2012, at 13:03. This page has been accessed 227,901 times.